Yesterday I wrote that I haven't missed a thing since giving or throwing away 10+ dumpsters worth of stuff when we moved into our condo 10 years ago. Upon further reflection, I decided that's not exactly true. I do miss the pine shelving units I got at IKEA that I first used in the spooky basement and subsequently used in the storage unit. When we got rid of the storage unit, we moved the pine shelves to the condo, where they acted as a bookcase/open storage in my study and provided storage in the closets until I replaced them during renovation a few years ago. At that point, I gave them away to a friend who now uses them as storage in his workshop. That's the beauty of such shelving: it's nothing if not versatile. And moreover, it's cheap. While the model I had ("Sten") appears to no longer be available, a similar product--"Gorm"-- is just $41.00 for a basic unit of four, 30" x 20" shelves. Extra shelves are just $7.00 each. Smaller shelves, such as the 20" x 12" size (perfect for a bookshelf) are just $3.00 each. The many faces of IKEA's flexible shelving. Left: in the storage unit before getting loaded; right: in my study as a bookcase/open storage. I found the 30" x 20" size fit perfectly in most standard-sized closets. If you have lots of boxes to store, you can rig the 30" x 20" shelves so that two rows of three photocopy boxes can fit on each shelf (see the photo, at left). This provides storage for 24 boxes per storage unit. The great thing about this solution is that access to any given box requires at most one box to be moved, i.e. if you need to get to a box on a shelf's bottom row, you would have to move the box on top of it--but that's all. If you've ever dug through columns of boxes shoved in a pile, the idea of being able to get to anything by only moving at most one box is a revelation. The 30" x 20" size is also great for large storage boxes that can hold everything from sports equipment to camping gear, while the 20" x 12" size is great for pots and gardening equipment as well as craft or cleaning supplies. Along with two widths--30" or 20"--and two depths--20" or 12"--Gorm comes in two heights: 43" or 68", and there is also an extender pack available to add an additional 23" of height. Pre-drilled holes at approximately 5" intervals allow for flexible shelf configuration. In addition to shelves, there are clip-on baskets, bottle racks, and corner shelves available. Ikea also offers combination configurations. I especially like the three section configuration with bottle rack, right. While it would take about 5 basic units to line a 15' wall in the garage, craft room, or basement, even one unit can provide storage relief. In these economic times, it may be hard to imagine spending money on a basement or garage makeover, but if you're able to put away just $10 a week, you could get a basic Gorm unit in a month. It would make a nice reward for first going through and getting rid of things you don't need in your Quest for an organized basement or garage. Whenever I go to a new watercolor class, there's a lot of oooohs and aaaaahs. It's not the level of my skill or the paintings themselves that get this reaction. It's the kit of supplies I put together. I first put together my own supply kit out of necessity: I couldn't find any ready-to-buy kits that had the stuff I liked or needed for a price I was willing to pay. And so I pieced together a kit of my own, hand-selecting the pigments I liked, adding a few necessary supplies: brushes and a palette, gum arabic and a couple of containers for water, a few pencils, paper towels, cotton balls, Q-tips, masking tape, and, of course, my color chart. Decide the purpose and scope of the kit. You'll need to decide if the purpose of your kit is to complete a single project or to enable you the flexibility to work on multiple projects. Typically my needlepoint kits and scrapbook kits center on a single project, while my drawing and painting kits are intended to accommodate any number of projects. It also helps to pinpoint where you'll be using your kit--if you'll be using your kit at home or if you'll need to transport it to a class--in order to determine how both large and how mobile your kit needs to be. Choose a suitable container. Baskets, sealable plastic bags, and boxes or small plastic containers of all types make for good, practical containers for kits. Before running out to buy anything, why not see what you already have on hand? Carefully edit your selection to what you really need and use. This is easier if your kit is the one-project sort, but even if it's not, it's helpful to limit most of your supplies to old standbys, especially if you'll be using your kit away from home. Organize it. Keep like things--i.e. 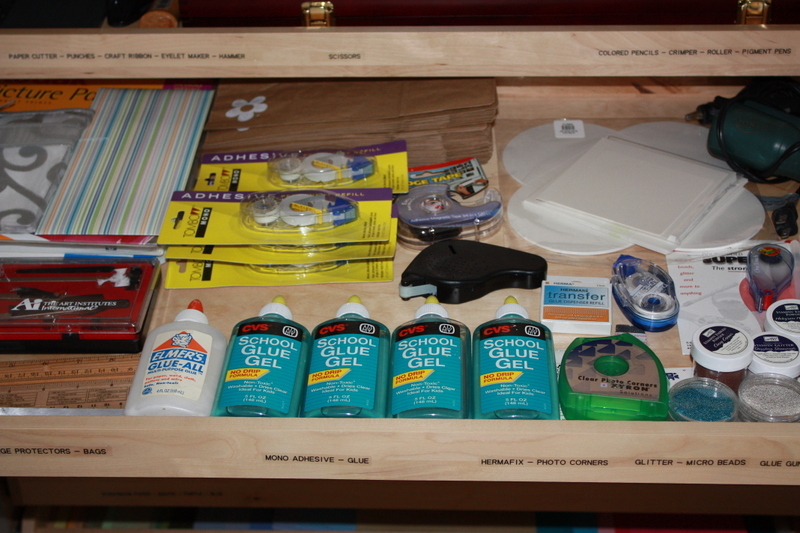 paints, stamp pads, metallic threads--together, or put your supplies in the order they'll be used. Make it attractive, make it fun. A kit is a gift you make to yourself, the better to enjoy your hobby. While the bow on my watercolor kit is practical, as the box doesn't have any other kind of closure, it makes me smile every time I tie it up. And every time I untie it, it feels like opening a present. We last discussed the role color charts play in keeping your arts or craft supplies organized. Today I thought I'd share a few tips on making the charts themselves. Use the materials you'll be using for the real thing. If you're doing a watercolor chart, use watercolor paper. Will you be using Bristol with your colored pencils or card stock with your ink pad? Then use those materials for your color swatches. Decide what order to use. When organizing color, most people find the color wheel approach--starting with one color and then moving through the rainbow via analogous colors, i.e. yellow-orange-red-purple-blue-green--to be naturally intuitive. Others may prefer to organize by the name, number, or "color family" the manufacturer uses. Decide how to indicate the color on your chart. Will you indicate the name next to or beneath the color? This is probably the most common approach and it's convenient , but it can also be visually distracting. What I like to do is to create an overlay of the color names on semi-translucent vellum (see the picture, above). You can also create a separate color key, reducing the scale as desired. Keep it consistent. Whatever the media you're working in--whether watercolor or acrylic paint, colored pencils, markers, pastels, a stamp dye, or a pigment pad--keep the area for each swatch identical in size and in shape, the better distinguish the crucial difference: color. This also means you'll want to apply the same stroke or use the same pressure for every color. If you're using ink or pigment pads for stamps, use the same image for every color swatch. See if the manufacturer offers blank charts. If you're primarily using a single manufacturer's product, blank charts from the manufacturer--often located on the company's website--are a convenient way to go. Other manufacturers may send blank charts to you upon request, or include charts with the products they sell. The chart below is included with Copic marker pads and features the same paper for the chart as in the pad. Perhaps one of the more surprising tricks for organizing art supplies that I picked up in design school was the importance of making color charts. Color charts save you the time and the hassle of searching for the perfect color for any given project, and this in turn can prevent quite a bit of mess. I used to lug my entire selection of colored pencils or markers to my drafting table. The problem with such an approach is that my work area would be piled with supplies I didn't need, making for cramped conditions. Nowadays, with my color chart in hand, I pull out just the supplies I need; it's easy, fast, and it ensures that I have the colors I want and the room I need in order to work. Color charts also help prevent costly mistakes in buying art supplies, as you can bring your color chart with you on shopping trips to determine your purchases and avoid buying unintended duplicates. Lastly, I've found that it's especially useful to use a color chart as a kind of where-to-find-it guide, in that I put my supplies in the same order that I use in my charts. Not only does this enable fast selection, but it is especially helpful for those supplies--such as pastels and colored pencils--that lose their labeling with use. I love my Prismacolor pencils, but after sharpening a few times, good luck knowing what color they are, as the color code quickly gets whittled away. The box the pencils came in is handsome enough, but doesn't stipulate what colors go where. I just use my the color chart I made as my what-goes-where guide, and am never at a loss for finding a particular color. 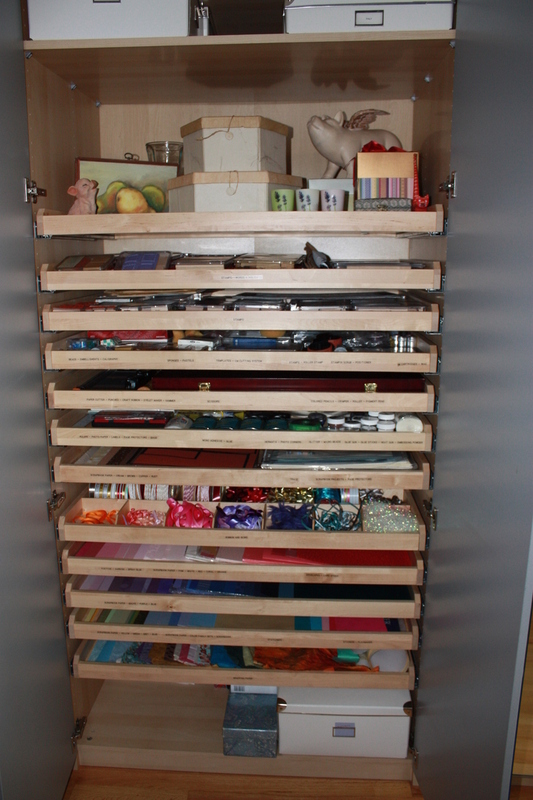 Back in September during Closet Week, I posted pix of the 39" closet I got from IKEA that I use as my craft closet, including pictures of scrapbook paper storage. This modified, flat-file approach is the only way I've found to satisfactorily store large pieces of paper, but the method is not without its flaws: any addition or subtraction to the drawer requires careful manipulation of all the surrounding pieces in order to keep the files looking tidy, an effort I find tedious.Still, I find that it's better--more convenient and less mess--than rolling large pieces of paper and storing them in tubes, which is another time-honored approach to large-paper storage. For smaller, more standard-size paper, such as 8-1/2" x 11" card stock, I much prefer to use hanging folders, which I find easier to access than the non-hanging sort. Because I was a demonstrator for an art supply company in a previous life, I have a life-time supply of their paper stock, and since I'm familiar with the names of the colors, I find it useful to name my file folders accordingly, one file for each color. For those with less elaborate collections, a system system based on the six major colors--green, blue, purple, red, orange, and yellow--plus another folder for white/cream card stock and one folder each for black, metallics, and neutrals--might suit you fine. Above: letter-sized hanging files for 8-1/2" x 11" card stock. The different file colors reflect the manufacturer's "color families". For easy identification, I use the Smead Labeling system referred to in previous posts. I inserted a hanging file frame which I cut to the exact dimensions of my shallow PAX sliding shelf, creating a customized filing drawer. In the process, I gained a good 25% more filing space than with the standard filing box I previously used. 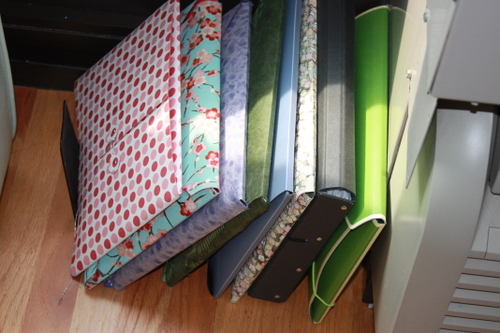 Note to scrapbookers: A friend from my demonstrator days told me that she uses a legal-size file cart and accompanying hanging folders, which apparently fit 12" x 12" scrapbooking paper. I haven't tried this myself, but if you're struggling with piles upon piles of scrapbook paper, you might take a 12" x 12" sheet to your local office supply store and see if it fits into a legal-size hanging folder and cart. Crafts are messy, as anyone who has drawn in charoal or has tried to remove the oil pastel stains can attest. When I was in design school, I would regularly scrub my drafting table, which tested both my patience and my upper-body strength, "scrub" indeed being the operative word. "Scour" was more like it. Who'd imagine that graphite, a substance so easily erasable, would be so hard to clean? Plain old soap-and-water was no match for the Mighty Graphite, which also made mockery of cleaning wipes. I tried scrubber sponges. I tried scrubbing brushes. Finally I turned to my trusty Comet, which worked, but it left a fine grit that took multiple rinses to alleviate, and required further wiping with a soft cloth to get rid of the grit altogether in a process not unlike polishing a vintage Rolls Royce and took about as long. One day, regaling my fellow students with the tale of my labor-intensive graphite-cleaning routine, my friend Jackie waited until I was done and then came over and put a hand on my shoulder. "Haven't you ever heard of the Magic Eraser?" she asked. I had not. Moreover, I was suspicious of any product with the word "magic" in its name, having never recovered from the trauma of the none-too-magical jumping beans I bought with an entire week's allowance when I was six. But Jackie's testimonial ("one wipe and the graphite's gone") was so compelling, I couldn't resist. And so I picked up a Mr.Clean Magic Eraser and--holy smokes, it worked! What used to take more than 15 minutes now took less than three. And I didn't have to work my biceps in the process. I found a fun blog that lists a good 5O uses for the Magic Eraser, including everything from removing scuff marks to nail polish spills. The only thing I can vouch for is graphitepaint-oil pastel-and-charcoal removal, but looking at the list on the blog, I just may have to experiment a bit. 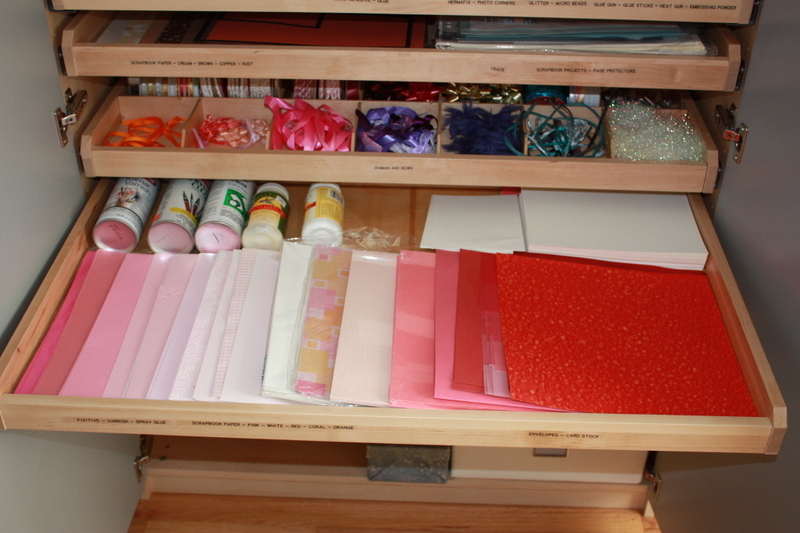 It's Craft Organization Week on the Quest! As I mentioned in my very first post back in July, as disorganized as I've been at times, there are certain things about which I'm almost fanatically tidy. As a teenager, my room was an unholy mess, but the organization of my makeup drawer was a study in precision. These days, it's my makeup drawer that's an unholy mess, but I'll spend a good hour washing out my paintbrushes, putting away my reference materials and supplies, and arranging my watercolors in the exact order they appear on the color chart I made of all the paint colors I own. God forbid I put Quinacridone Burnt Scarlet in the place I have specifically designated for Alizarin Crimson, because that's just wrong. While some of my art supply organization is a little over the top, the truth is nothing can spoil a creative mood faster than not being able to find a particular tool, supply, color, or project component. With the cold winter weather settling in, it's a perfect time for any number of indoor hobbies, including painting, jewelry making, needlepoint, scrap booking, and card making. So I thought it's time for a series on Arts and Crafts Organization. We'll go over paper storage, creating "kits" of frequently-used supplies, making color charts for reference and as an organizational aid, finding storage space, and easy clean-up tips so you'll be all set when inspiration strikes. Who says organizing can't be fun? In another life--I've had several--I demonstrated card- and scrapbook-making supplies, whereby I'd go to people's homes and show them how to use various products. In order to organize the order forms, wish lists, and door prize entries, not to mention the projects themselves, I bought a dozen or more plain white binders to hand out at the demonstrations. I attached a clear business card holder on the inside cover of each binder to hold my card and used a special, 3-hole punched, reinforced magazine holder strip through which I slipped the large catalog for easy viewing. It was great fun while it lasted, but when it was over one of the first thoughts I had was that I'd never have reason to use up the dozen-plus binders I'd bought. Little did I know just how useful I'd find them. 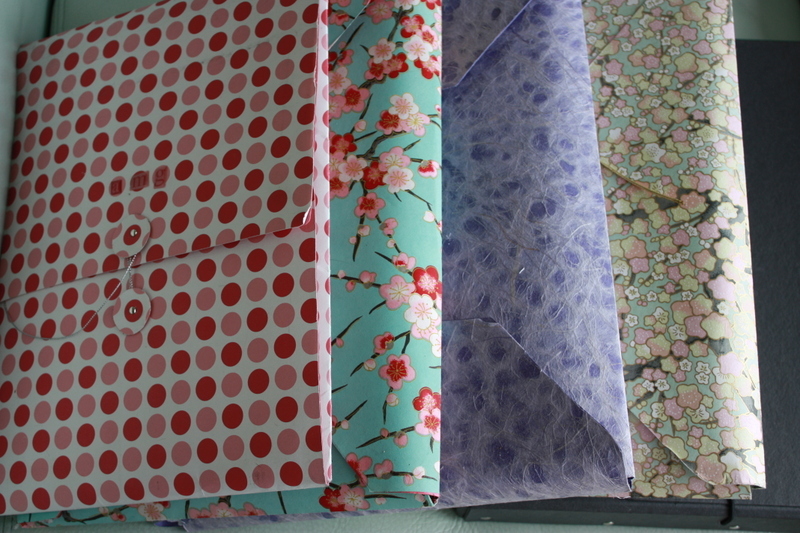 For one thing, binders are great for organizing craft supplies. In making cards and scrapbook pages, for instance, one uses generates a number of scraps, some of which would make great cards or pages of their own. 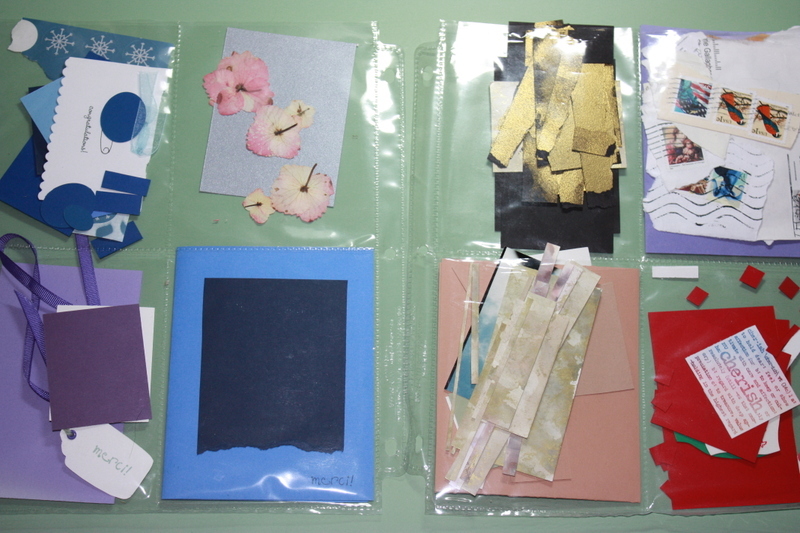 A fellow demonstrator showed me how she used page protectors to store such scraps, which she organized by color. The trick was using photo pages, which split the page into quarters or in half--perfect for capturing scrap-sized bits and pieces. I also use the photo pages to store cards I've made. The photo page/binder format makes for quick and easy scanning for the perfect card. 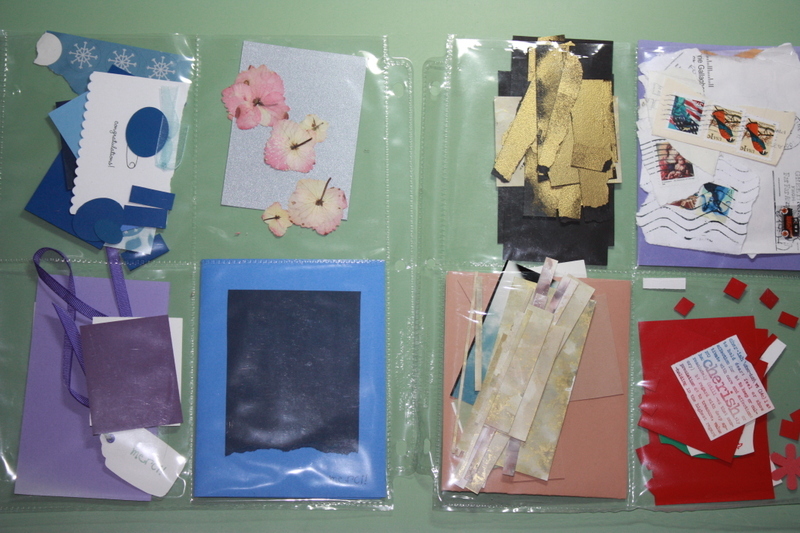 Above: card-making scraps in quarter-page pockets. 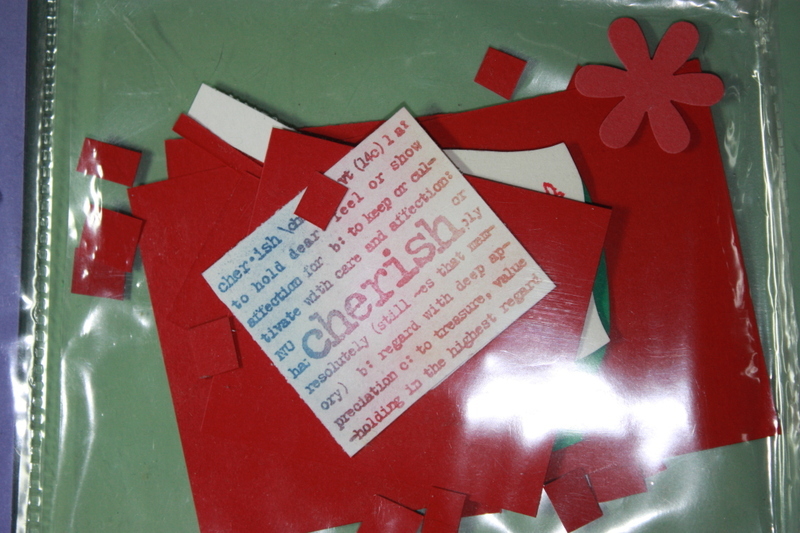 Below, top row: close up of quarter-page pocket card-making scraps. 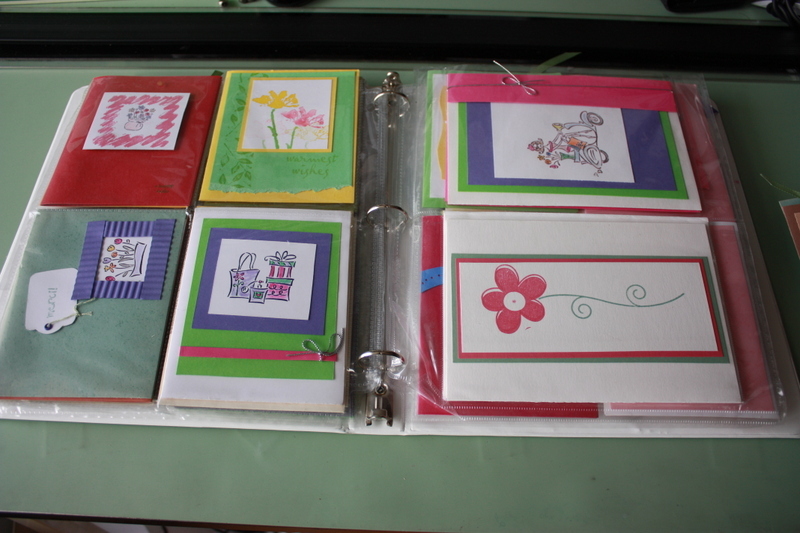 Below, bottom row: completed cards organized in quarter and half-page pockets. When I was 19, I spent the summer and fall semester in Paris. So many things struck me as agreeably new and different: the concept of cheese as a dessert course; having different verb forms distinguishing friends and family from strangers; scarves used as a means of personal expression, rather than just to keep warm. It was also the first time I saw a folio, a kind of cross between a folder and an large envelope, with a decorative band or ribbon ties to keep the contents secure and tidy. Folios are attractive options to folders, equally suitable at home, in the office, or at school, and particularly useful for corralling paperwork pertaining to a particular project. I also use them to archive my loose-leaf journal entries, which I've been keeping more or less every day since. . . let's see. . .1974. Folios are hard to come by here in the States; multiple Google searches were not fruitful. I've had occasional luck finding folios in paper or art supply stores. Semikolon makes a nice, slim folio, while Resource International offers more storage with a 1" size. Happily, once you have a folio to template off of, it's easy to make your own folios. Slim folios like Semikolon's lie flat, which makes tracing the outline easy. All the cutting and scoring is done with an exacto knife on a large cutting mat. The real trick is finding a piece of paper large enough and sturdy enough to be functional. I use a sturdy "cover" card stock from Paper Source. The 20" x 26" size is plenty big, the color selection is great, and at $1.50 a sheet, the price is right. 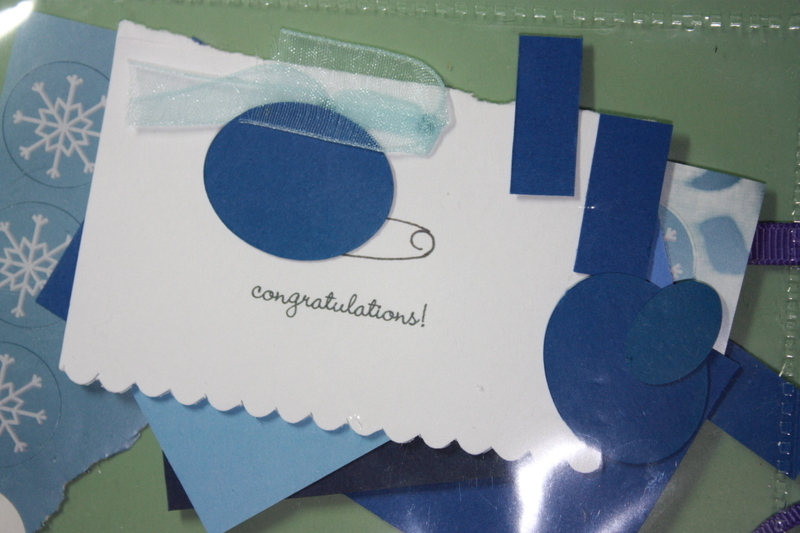 I then cover the card stock with a pretty, decorative paper using good old-fashioned rubber cement as the adhesive. My favorite part is coming up with decorate fasteners and ties; I tend to favor the ribbon-and-two card stock discs approach, although I've also successfully used velcro fasteners with beaded pulls. No matter how many folios I have, it seems I could always use a few more. from left to right: hand-made folio made with card stock and red-and-pink polka dot paper; card stock and Japanese plum blossom paper folio; card stock and lilac lace paper folio; folio made with card stock and green leaf paper from Nepal; store-bought vinyl folio (discontinued); another folio made with card stock and Japanese paper (can't get enough of those plum blossoms! ); Resource International 1" folio in slate gray; and Semikolon folio. Close up. You can see the double card stock disc and corded ribbon fastener on the polka dot folio. 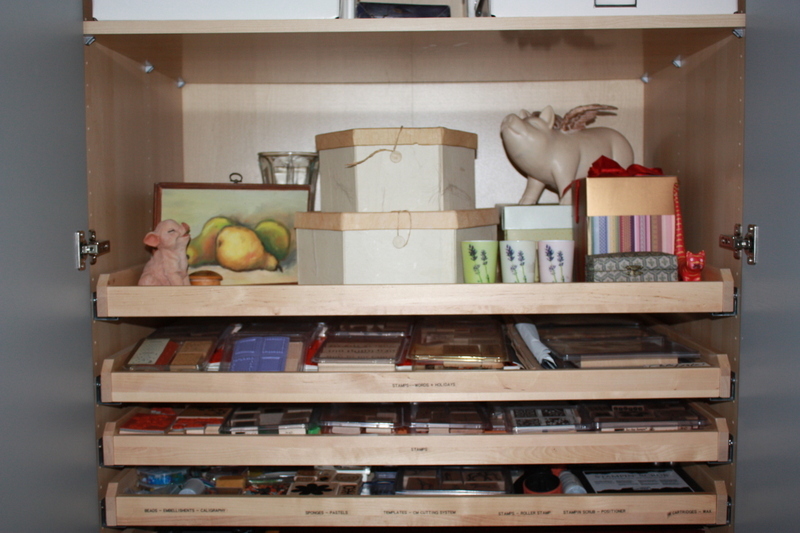 I concentrated on one shelf or drawer at a time, worked through to completion, taking only short breaks if any. 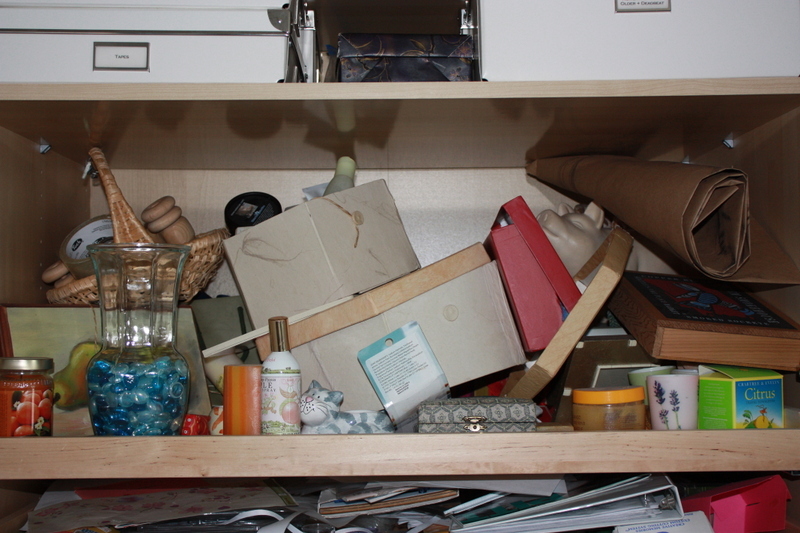 I completely emptied the shelf or drawer of its contents, then wiped out the drawer before putting things back. I assessed everything in each drawer, opening jars, bottles, tubes, and ink pads to ensure the contents were in good condition, and tossing anything that was no longer fresh or usable. 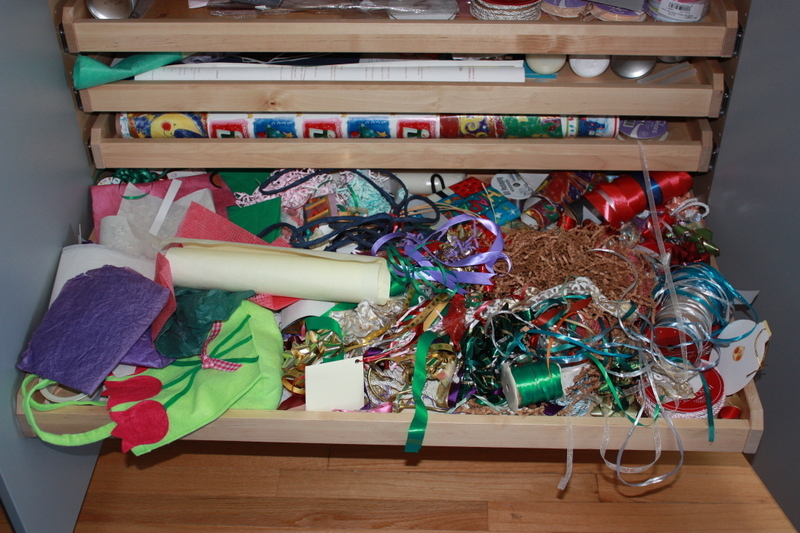 Similarly, I assessed my paper supplies, ribbon, bows, and embellishments, tossing damaged goods. Group replacement parts and refills by the item (glue sticks by glue gun; replacement blades by paper cutter). Group accessories with the items they are used with, i.e. sponge daubers with pastels; embossing powders with embossing gun). 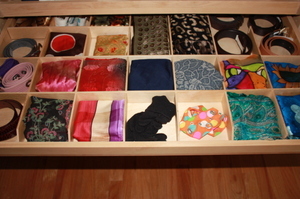 Organize colors by color family or rainbow order: red-orange-yellow-green-blue-purple, with separate place for neutrals. 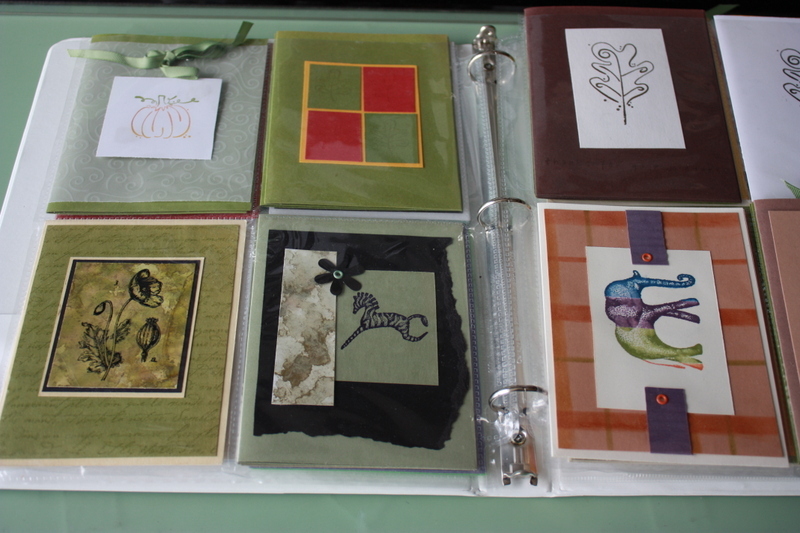 Partly-completed scrapbook pages can tuck into page protectors along with the component needed to finish the page (i.e. pictures, embellishments, printed text or mementoes, etc.). 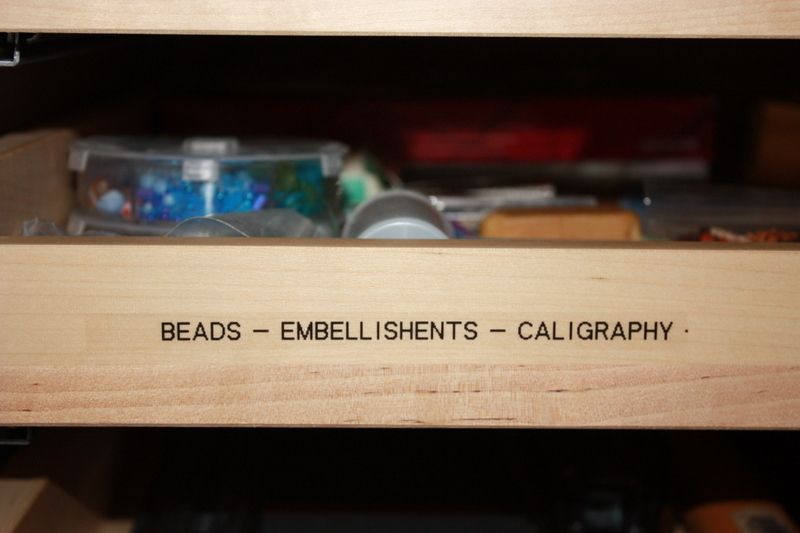 I finally broke down and labeled all the the drawers according to content. No more opening one drawer after another after another trying to find where I put a particular supply. 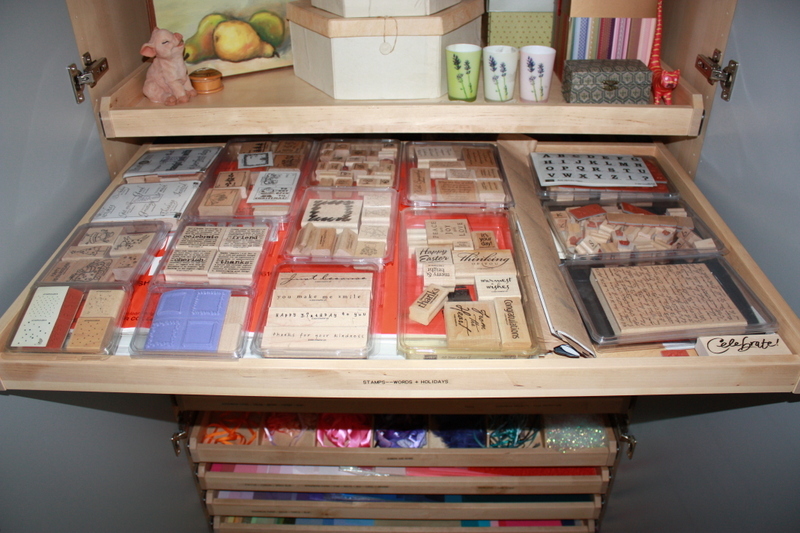 I've found the small, clear boxes that Stampin' Up! stamp sets come in are very handy for organizing watercolor paint tubes, as well as separately-purchased stamps from other vendors. It took 14 hours over 4 days to organize 4 shelves and 11 drawers (23" deep, 39" wide). It took a little over an hour to make the drawer labels. 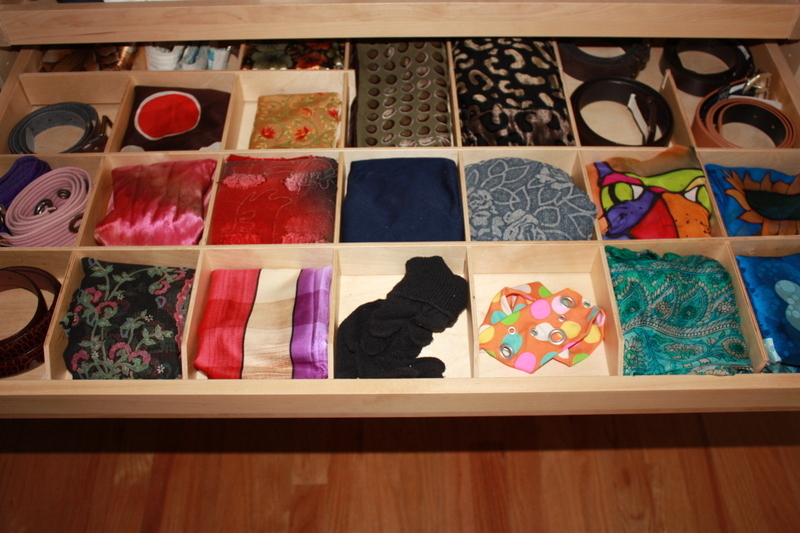 Least amount of time to organize: a shelf with storage boxes (9 minutes). 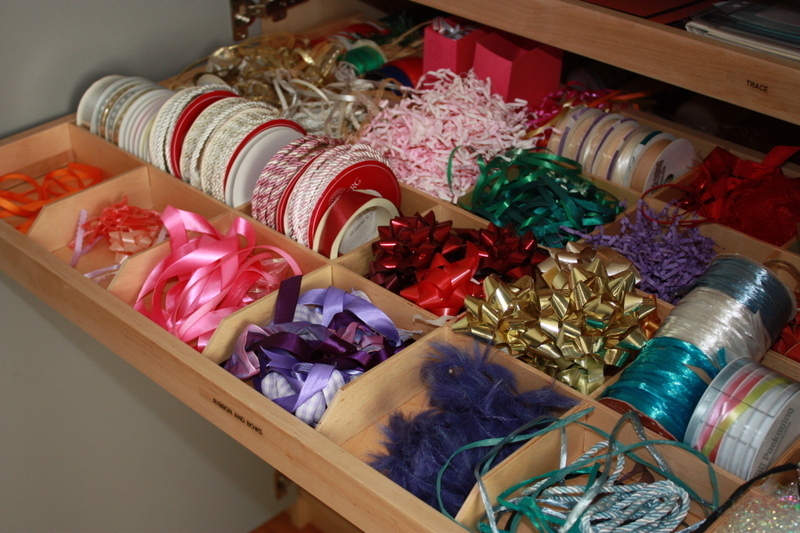 Most amount of time to organize: the ribbon drawer (2 hours and 16 minutes). Once upon a time, my art and scrapbooking supplies were completely organized: tubes of watercolor nestled together agreeably , embossing powders were lined up in neat little rows. My scrapbooking paper was fanned out according to color family and I always knew where my eyelet maker was. And then I went back to school. Over the next two years, I used my supplies on almost daily; they proved to be useful in the art and design classes I took. But somewhere along the way, I developed the not-really-put-away technique whereby I would open the craft closet door and stack, in no particular order, new supplies and old, along with class projects, various drafts, reference materials, and all kinds of this-might-come-in-handy-some-day bits and pieces. And then I would shut the door. 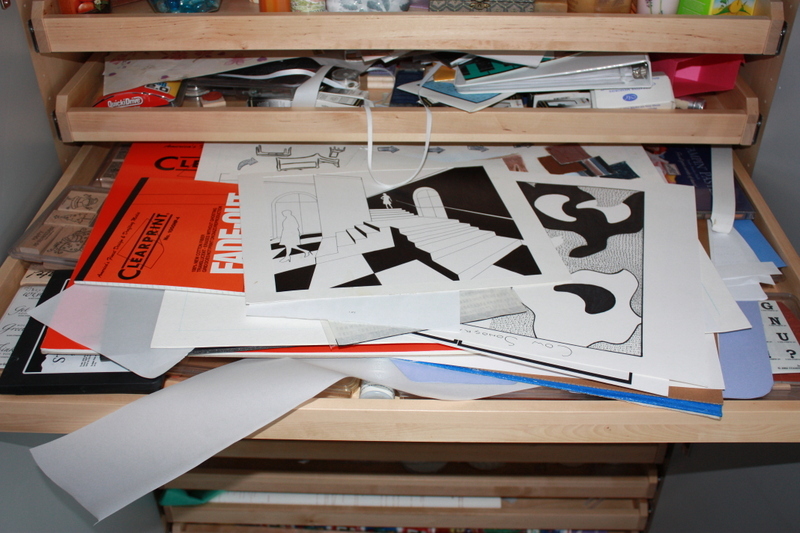 It got to the point that I couldn't open any of the drawers without causing a chain-reaction avalanche requiring desperate, two-handed maneuvers to circumvent. Great fun for the kittens. Less fun for me. So last week, after 30 panicked minutes in which I lost Lickity Split and finally found him tucked in the ribbon drawer only after Snapdragon ratted him out, I decided it was time to deal with the craft closet already. I figured it'd take me an hour, maybe two. It ended up taking 14 hours, but in the end, I'd gone through everything, threw out a ton and organized the rest. In the process, I switched things around so the ribbon drawer was higher and installed a drawer divider to make it a less appealing hiding place for a certain kitten. With the PAX/Komplement system, designing your own closet is easy. Start with the frame: choose from two heights -- 79" or 93" (6' -7" or 7'-9") and two depths -- 13-3/4" or 22-7/8". (Note: the only interior option for the narrow-depth units are standard shelves, I believe.) Next choose the width-- either 19-5/8" or 39-3/8". Proceed to pick from one of the five finishes available, and you have the frame. Now's the fun part: customizing your dream closet with interior fittings. For the deeper units,the choices go far beyond the standard rod-shelf-drawer options, and to include jewlry boxes, shallow pull-out shelves with dividers, shoe organizers, and wire baskets, and more, which can be combined in almost limitless combinations. There are a total of 70 pre-drilled holes in the 93" tall unit, or about one hole every 1-1/4" or so, allowing for both great flexibility and precision in the placement of the fittings. 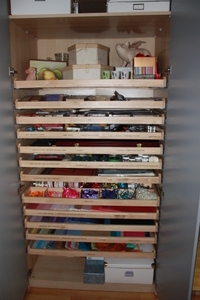 When I got my units, the contractors who installed them couldn't imagine why I would want shallow pull-out shelves installed every three holes, but I knew exactly what I planned to do with it: organize my scrapbooking and craft supplies (see right). That's the beauty of the PAX system: you can--and I do--use it for anything. On a more traditional closet note, I designed one unit as a regular closet, with a rod hung high to accommodate long coats and dresses. Another unit is designed with two rods, one high and one low, for hanging shirts, jackets, and skirts; for both units, I installed a shelf above the rod for storage. 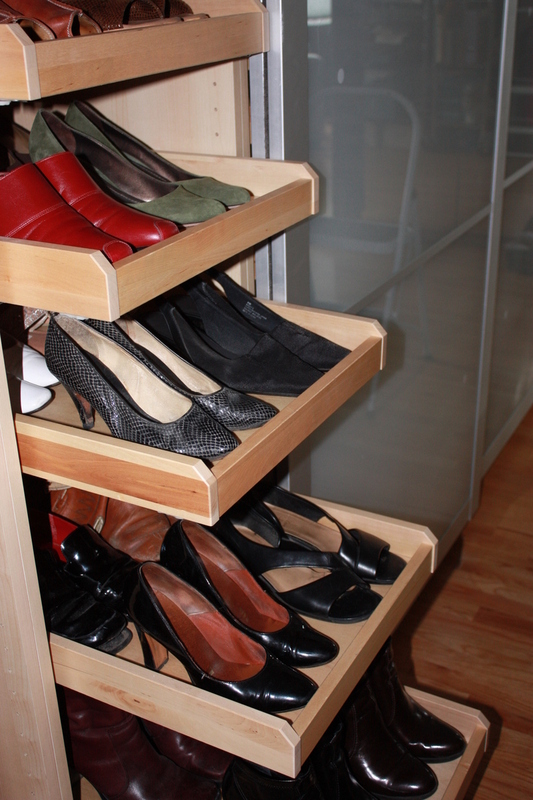 I also designed a narrow-width unit to act as a shoe closet; another narrow-width unit houses my purses and our luggage, each piece of which is nested consequetively within eachother. 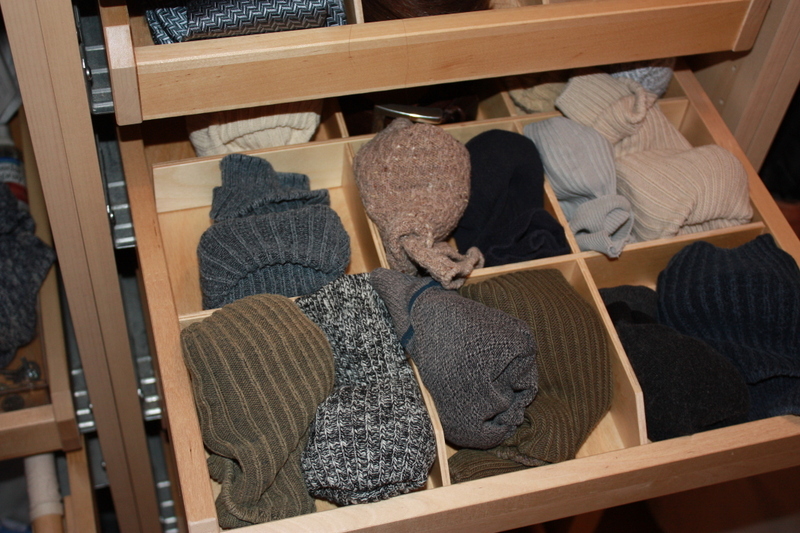 Because Alpay prefers to fold his clothes rather than to hang them, I designed his closet to have lots of shallow pull-out shelves, including one with dividers for his socks and another for his ties and belts. I liked the effect so much, I installed dividers for my accessories as well. When I got my system in 2005, pull-out hampers were also available, and so I installed his-and-her hampers. 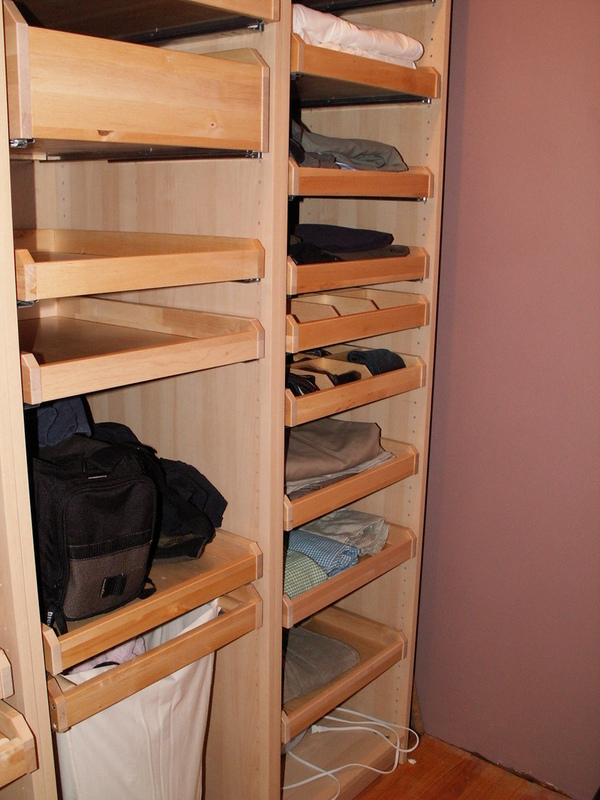 Bathroom storage runs short in our condo, so I added deep drawers with dividers in the master closet to store supplies. 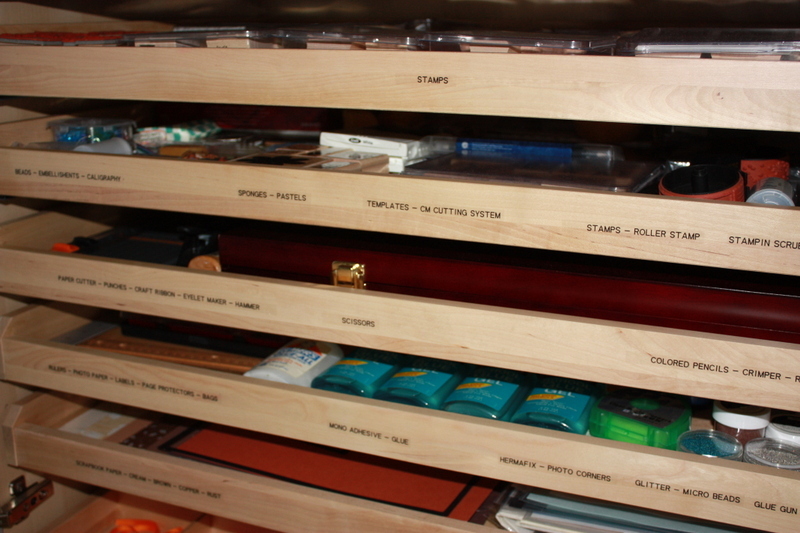 I even designed two of the double-wide pull-out shelves in my study to act as our tool-box.